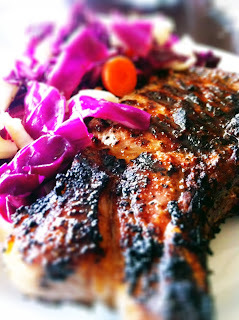 I also like spices and I think pork is the perfect canvas for a peppery spice rub. The rub coupled with the charcoal grill action made for a super easy and delicious chop. I have to admit I was never a very big fan of pork chops. I always thought of them as dry and blah. Well, as I have learned over the years, the key is not overcooking them because even the best quality meat can become a disaster. Coat the chops with the spice mixture. Literally rub it in, especially on the fat. Let the grill heat up about medium heat (where you can hold your hand over the heat for 4 to 5 seconds). Lightly drizzle the chops with a touch of olive oil. Place the chops on the grill. Cook the chops for about 8 minutes, then flip them over and cook for another 5 to 10 minutes. The chops are ready when there is a still a hint of pink at the center. Take them off the grill and serve. I served the chops with a cabbage and carrot slaw. The fresh crunch was a nice compliment to the spicy chops. In the summer, grilled fruit like sweet, fresh peaches would make a fantastic topper for the chops. Thanks for sharing that recipe. It definitely looks good and delicious.